I used to like making dinner. But being a wife, mama, full-time employee, and sometimes blogger leave me little time to devote to trying new recipes. Plus after Rowan is in bed its hard to resist the urge to sink into the couch with a big glass of wine. I also blame the holiday season for making it really easy to call cookies an acceptable form of dinner. Or is that just me? Anyway I've rounded up our favorite go-to recipes that are on repeat in our weekly menus! These are all picky-eater + husband-approved, can be made with very little effort and under 30 minutes (aside from the cooking part with the crockpot), and they make great leftovers. - Definitely don't forget to use crockpot liners for these, they might be the greatest invention ever. - Prep your veggies for the week by chopping and then roasting or sauteing all at once. I find this makes it much more likely I will eat them and they won't go bad! Recipe: In a large bowl, combine ground beef, breadcrumbs, egg, parsley, garlic and cheese. Mix all of the ingredients and form small meatballs. Pour pasta sauce, canned tomatoes, parsley, and minced garlic into crockpot. Add meatballs, cover and cook on low for 4 to 5 hours. Meatballs can be made ahead and frozen. Recipe: Put the steak in your crockpot, fill with enough beef broth that it covers the steak (you can also use water if you don't have broth), and sprinkle some garlic salt and steak seasoning. I usually go pretty heavy with the steak seasoning because we love the flavor. Cook on high for 4-5 hours or until the steak shreds apart really easily. Right before eating, saute peppers and onions. Place shredded steak and veggies in your hoagie roll, top with provolone cheese, and broil on low for 8-10 minutes. Recipe: I use this skinny alfredo recipe and its super easy, makes enough for a few meals, and its healthy-ish! Melt butter in a saucepan, whisk in flour, and then gradually whisk in milk. Allow to cook for about 2 minutes while stirring. Add heavy cream and garlic powder until it thickens slightly, then add the cheeses until melted. Toss with pasta and veggies and top with pepper and some fresh parley if you're feeling fancy. Recipe: I'm lazy about following this recipe so I basically just throw all of the ingredients in a pot on the stove or in my crockpot all at once. Cook for 20-30 minutes on the stovetop or on low in the crockpot for an hour or however long you feel like it? See I told you I'm lazy about this one. You can't really mess it up! There you have it, our favorite meals for those crazy busy weeks when you don't feel like cooking! Any of your favorites that I should add to our menu? Meatballs are our go-to when life is super busy! And thank the Lord for the crockpot, best invention ever. We love to make a batch of BBQ/hot sauce shredded chicken in there and eat it all week! What? Crockpot liners are a thing?? I never use my crockpot because i hate washing it! Please tell me more! 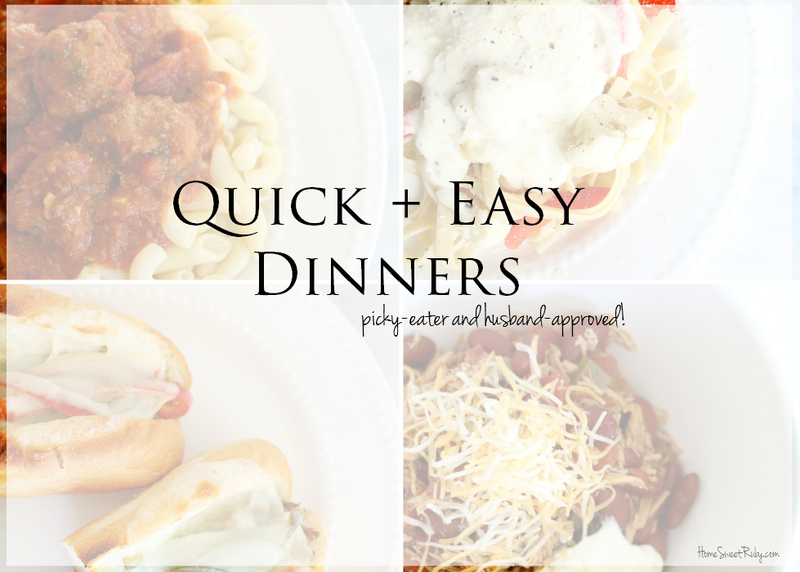 Definitely need some quick dinner ideas! We eat out now more than I'd like to admit. Confession: I've never made meatballs! I'm definitely adding these to our "to make" list though. Yum! I'm all about the quick meals... otherwise we just end up going out. ha!